This week has seen more flooding in Australia as a quarter of the area of Victoria is under water. 245 residents of aged care facilities have been evacuated to safety as towns such as Rochester in central Victoria was inundated by floodwaters. For those residents with dementia this was a difficult and confusing experience. For staff whose own homes were threatened it was also a difficult and stressful experience. Can you tell us what happened to you? Do you have relatives in the flooded areas. Queensland and Victoria now continue the cleanup of sodden homes and businesses. Our thoughts are with you all. A note of support and concern for all our friends living in the flood affected areas of Queensland. We know many of you will be struggling with your own homes and families affected and also trying to be there for the elders you are caring for who may also be located on flooded areas. We are thinking of you all and ready to support in any way we can. Know your distressing situation touches us all. We wish you speedy recovery to normal life but know it will take months and years for many. The trauma of this will, like the bushfires of 2009 in Victoria, take tens of years to recover from. Many will be changed by it for the rest of their lives. You can find out more about how to deal with natural disaster trauma at www.psychology.org.au, the website of the Australian Psychological Society. There is information on how to recognise that you are having a “more than usual reaction” to what is happening, how to communicate well with children about such traumatic events as well as good information for you both for coping now and in the future. If you are able tell us of your situation. I have just visited Changi Prison Museum and Chapel in Singapore. I am here for four days to conduct a Dementia Care Mapping course with Virginia Moore in the Lions Home for Elders. The museum is a very moving chronicle of the tragedy of 1942-1945 in Singapore under the Japanese. I am reminded of the several POWs I have had the privilege to talk to in my time as a psychologist working with people living in nursing homes and hostels in Victoria, Australia., many of whom had dementia and were reliving the horrors of those 3 1/2 years in prison. Changi was not the only POW camp. 16,000 died on the Thai-Burma railway. 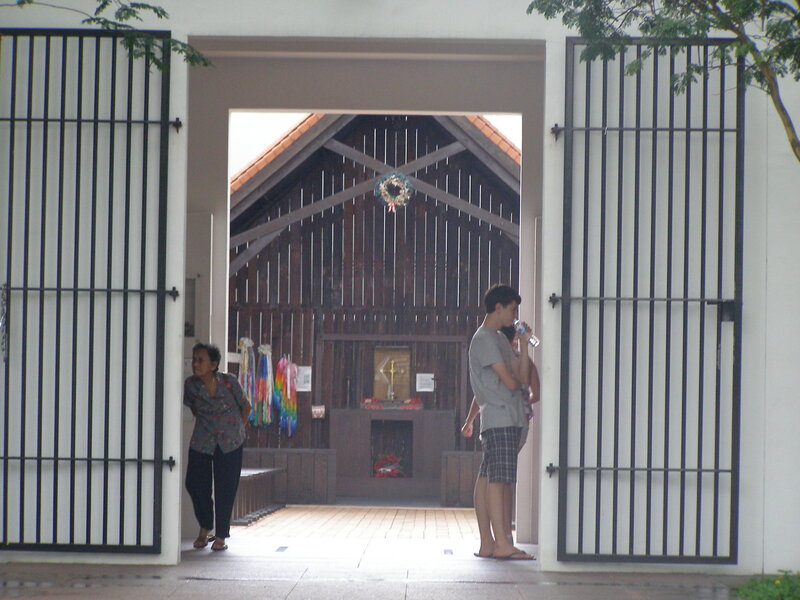 Many civilians died in the villages of Singapore and beyond. Stories of heroism and immense suffering in the face of unthinkable cruelty made me numb with the barbarity of some of the things that were done to people. But it still happens if you look at the newspapers and TV. People can be both cruel and wonderful to each other. I was viewing it for a moment in my life but the soldiers and civilians who lived through it endured it for 3 1/2 years not knowing if it would end. Not all Japanese were cruel. There is the story of the Japanese man who was in Changi prison for spying before the war and was released when the Japanese overtook Singapore, to take up a position with the military government in charge of welfare. He ensured many survived with permits and passes that he did not have to give. Thirty years after the war he was welcomed back by the people who remembered his goodness. There are photographs of two unnamed young Japanese soldiers who gave Vitamin B tablets to soldiers. Weary Dunlop has demonstrated the way to build bonds of relationship that can overcome fearful anger and resentment. We had the pleasure of hosting a Japanese student a couple of years ago and it was a happy sharing of stories and perspectives that I am sure will build interest and positivity into the future. I wonder from the safety of my room how I would cope. What would I do? Would I be able to withstand the daily punishments and deprivation. I guess those men and women must have asked themselves similar questions. They were ordinary people much like you and me, asked to do extraordinary things under extraordinary circumstances. I can only say thanks for the example and the memory of their endurance. I think of them today and remember the men and women I have come across who have suffered not just physically but now in the course of the progress of dementia find themselves mixing up present and past. Unfortunately their past contains unpleasant memories that confuse and hurt them, causing them to be fearful or angry or afraid. It calls on all my empathy and compassion to try to understand what it must be like to live in that reality again. For many their bodies now look and feel like they did but now due to ageing and the wasting of inactivity rather than starvation and malnutrition. The very weight loss is enough to convince their brains that now is then. Tell me about your experiences caring for people who have endured the punishments of being a POW. How is your stress? Some people I see at work in aged care live with very high levels of stress. Some of it is work related and sometimes this is complicated by stress at home. What is your stress level like? Stress accumulates. If you don’t do something to lower it or solve the issue that is making you stressed it just builds and builds. If it builds slowly you can become so accustomed to it that you don’t notice how stressed and ill you have become. Is this a description of you. You might like to try our poll on stress below. leave comments on your stress. What is making you stressed and how are you dealing with it?